** This app is only of use if you already have LogTen Pro 6 installed and need to transfer data to the latest version. ** LogTen Pro version 6 was designed in 2011, and does not run on iOS 11. 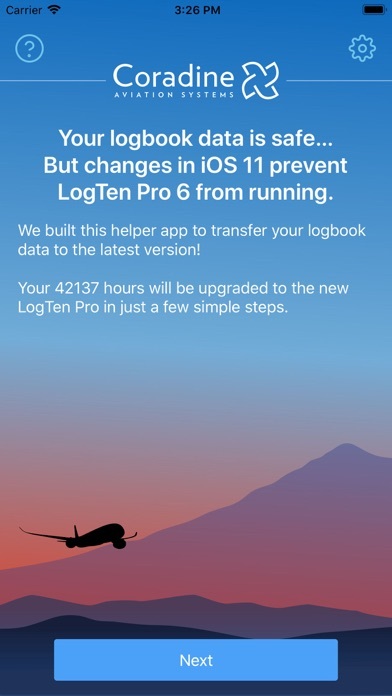 This simple app allows your LogTen Pro 6 logbook to be transferred to the latest version of LogTen Pro where you can view and edit your existing entries, generate reports, and more at no charge. To add new flights, and take advantage of all the new features, a subscription will be required. Update 9/7:Promises, promises, promises .... A few days after this posting I was contacted, and was told engineering will fix the report to show the approaches. 2 months and still nothing, when all it takes it is just no more than 2 hrs to fix the report. Their recommendation was to buy the mac $99 product which allows the custom report generation, and when I asked for a trial, they said we are not setup with app store for this, not even a discount/credit! A reputable business should take care of their customers... Org posting 7/18: I took my IFR checkride last week. This app has been reviewed and advertised as a logbook replacing the paperback. Upon printing a report of the log from my ipad which in fact is advertised to go in a $35 binder, examiner did not accept it because critical information was cut, ex: one approach and not the required 3 and holdings, etc was not printed. Luckily, I had my CFI there and he had to redline it and sign it. It has been now 3 days since I posted in their support assistance on the reports and also sent them email, no response yet. The syncing functionality is broken, regardless of how you choose to sync. Their "support" is non-existent, and after following their guidance I lost the primary logbook copy. There are other issues, and it seems there is little motivation for them to address them. A complete mess. Excellent app, until they upgrade it and you have to pay for the update. I say have to because thats what u have to do. You are unable to print your logbook unless you update. So great app but bad buisness strategy. Wow, these guys really take the biscuit. So I am now buying yet another full version of their software (already overpriced) on my iPad. This is at least the third time I have bought their software on the iPad. What is extraordinary is that I also have to re-buy the software on my Mac and iPhone. Seriously!!!! What is worse is that the upgrade process has muddled up the older version of the logbook stored on the mac with the newer version stored on the iPad. I have been a longstanding user of this company’s software (despite having had a total loss of a logbook many years ago when I upgraded my first iPad). Sadly, their software seems to be the best solution on the market, but that is not saying much. The field is hopelessly poorly serviced and thus Coradine have really got an easy time of it here. Can somebody else please please write a decent competitive logbook and give these people a real run for their money. Buyer Beware! I love this app! Really easy to track your currency's and total time. Logging time is quick and easy! Just one request, have a count down for ATP/restricted ATP. I am using this logbook for quite a few years now. I had another product for windows before and can only endorse logten pro - a much superior experience. I am an airline pilot and this is the best logbook for me!! I have kept an electronic logbook for years and this is the best one I have seen yet. I own the iphone/ ipad/ and Mac version. These all now sync through the cloud and it is awesome. Not like another program I know of that you have to pay a fee to sync wirelessly. If your in need of a program to keep track of your flight time this is it! I went back and logged all my training which was painful but ever since I started teaching i've been using this app and it works quite well. I have been using the app for just over two years now. It is fantastic. The app makes it so easy to determine how many hours of a certain type I have flown in x days for insurance purposes. It also makes it easy to check currency. I highly recommend it.